The tendency of managers to watch a game from the sideline can be a bit of a puzzling one. Yes you are close to the action, but one would think that you would get a much better view of what was happening up on the pitch from the stand. 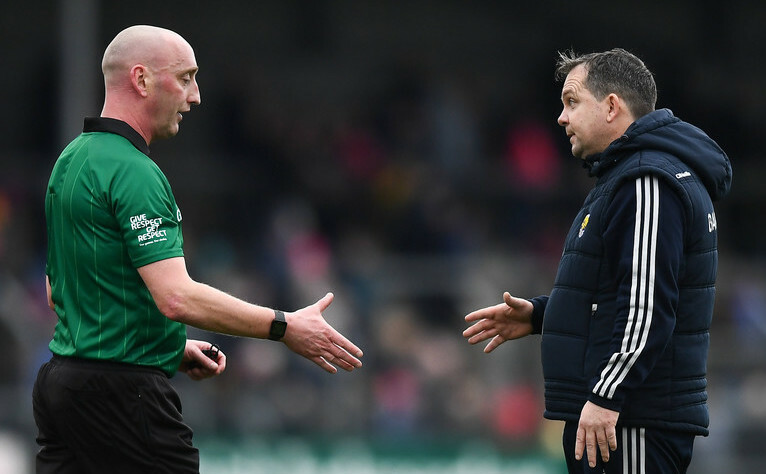 Davy Fitzgerald is one manager who seems to have copped onto this, and he has made a habit of watching the opening half of matches from a better vantage point. He then goes down to the sideline to give his players a bit of a boost in the second period, offering some words of encouragement when the going gets tough. Massive for us. He's been sat up in the stand for the first seeing how things are going, then coming down down in the second half to make the right calls and drive us over the line. I was up in the premium level in Croke Park last Sunday, and you could see what Limerick were doing with their puck outs, what Waterford were trying to do. You just see everything that is going on, you're in a calm spot up there and you're not going to make any rash decisions from emotion on the sideline. I think he has managed it very well and it's gotten us over the line in a few of the league games. He's great to have on the sideline because he is going to fight your corner to the death, as long as we stay focused and don't get distracted it's a bonus for us. The lads would go on to speak about the influence the body language of a manager can have on his players, and the fine line that you can thread in showing some passion on the sideline. Maurice: Derek McGrath spoke about the idea of body language, and what a coach's body language did to a team. He put up a screenshot of him the day they got hammered in the Munster championship, he had head down, arms folded sitting on the sideline looking very glum, and what he felt that did to his team in terms of sending a message. I thought it was really interesting to see on the flip side that, is there anybody more animated on the sideline than Davy? That is something they can clearly feed off. Going back that to that body language idea, your sideline conduct really matters. Maurice: Every team now has somebody sitting up in the stands really, all the top teams. Kerry have Done Buckley doing it, Donegal have Stephen Rochford as we spoke about on the show last week. That is hugely important to your practical setup and how you adjust your game, even puck out patterns or whatever that may be. Simultaneously you also need someone on the sideline to give you a lift, and I guess that Davy is trying to marriage the tow of them now. You can download the podcast on Sticher, Spotify, Itunes, Pocketcast or any other podcast platform. Subscribe to the 'Balls.ie' GAA feed for extra content including long-form interviews and in-depth discussion. When Does Targeting County Players In Club Games Go Too Far?